G: And not very cartoony. And then he started submitting gags and comic strips and he simplified his style. The book has submissions for syndication that weren’t accepted. You can see he was playing with dialogue, placement of dialogue, with silent comic strips…and then, what’s great is (there are photos of him and his life, he’s beloved and respected) …there are other drawings he did. I believe he lived in Montreal throughout his life, so there are a lot of images he did for The Standard magazine there. He drew amazing cars, he really reduced their designs to simple lines. 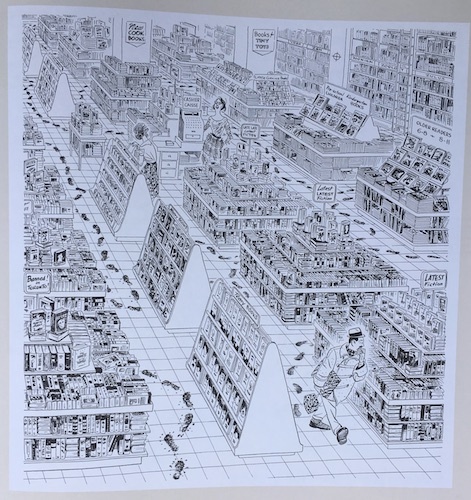 Look at the detail in these oversized drawings — this is why the book has to be so big. 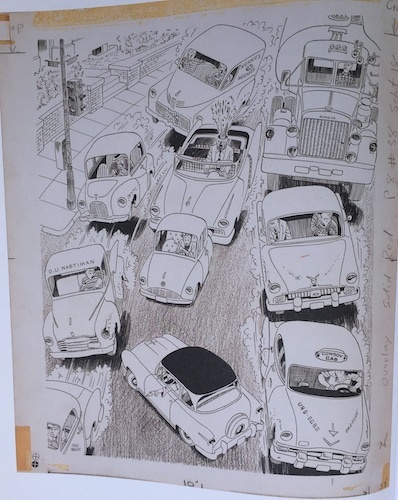 G: There are other drawings, other comic strips…look at that picture on p. 64 of cars in traffic, for a magazine. G: The traffic seems to be breaking the boundaries of the page. And this is a Montreal Star cover, a drawing of the inside of a bookstore. I just love it. And a guy is tracking mud throughout the store. S: The book display signs are great: “Banned in Toronto.” (laughs) And all of the books are drawn, they don’t seem to be mere suggestions of books. G: It’s an incredible level of detail. Another super cool thing: his personal Christmas cards. And this is the first few years of Nipper, in vertical columns. The number of panels he used varied. He started out using lots of reds. I’m not sure if this was the same size it appeared at originally or not, but the art is huge in this book. And they’re all silent, the misadventures of the little boy, Nipper. Are you struck by how they feel like they’re from an earlier, idealized time? They have a great sense of motion and emotion without words. And they’re all on the same theme. It started in 1949. And then in 1950 he drew a full page comic for Christmas, the first time he did that. What I like about it is that the boy’s parents wait until he’s asleep to bring the Christmas tree in. Was that a thing? Was it a secret? Was Santa bringing trees back then? S: Not in my family. G: And then of course he wakes his exhausted parents up super early in the morning. Wright went on like this until about 1951 when he removed the red border and started putting the red into the comic strips as an accent color. What I love is that some are 8 panels tall, some are 6 panels, some are just 4 panels tall. Here’s another Christmas strip (full color, full page) where a kid listens to “Jingle Bells” over and over and over again until the dad finally buries the record in the yard. S: He really used the space flexibly. G: And there was no sense that he was crowding the space, either, despite how much is going on in the strips. It feels open because Wright isn’t using all of the available space. That white space let it all breathe. And it’s all about this obnoxious boy. I often think that the vertical format for comic strips is more Japanese. I wonder if, way back when, this was done more in North American newspapers, before space for comics become so much more limited. Here’s Nipper with a sucker. He puts it on the floor as the cat tries to grab the wrapper, and it ends up stuck to the back of the cat. Wright used other colors, too. There’s one about a fireworks display with a lot of blue in it. G: So this includes content through 1962, then the ’63-’64 collection I have is very small, and it’s wider than it is tall, a much different form factor. And it looks like the format of his strips had totally changed by then, that he’d gone to using what I think of as the Sunday comics format, which allowed him to have super wide panels. S: You’re sure they didn’t just rearrange that for the big book? G: I think so. The later strips wouldn’t have fit together right for a vertical display. There are some that have page-wide panels. But he varied the format within the traditional Sunday comics space, too. He didn’t stick with the same number of panels on top and bottom row. It looks like he just did whatever served the idea for a particular strip, which I like so much. And which is the opposite of what Schulz did in Peanuts dailies, where he almost always stuck with 4 panel comics.